The release of IL-1β is a tightly controlled process that requires induced synthesis of the precursor pro-IL-1β and a second stimulus that initiates cleavage and secretion of mature IL-1β. Although ATP as a second stimulus potently promotes IL-1β maturation and release via P2X7 receptor activation, millimolar ATP concentrations are needed. The human cathelicidin-derived peptide LL37 is a potent antimicrobial peptide produced predominantly by neutrophils and epithelial cells. In this study, we report that LL37 stimulation of LPS-primed monocytes leads to maturation and release of IL-1β via the P2X7 receptor. 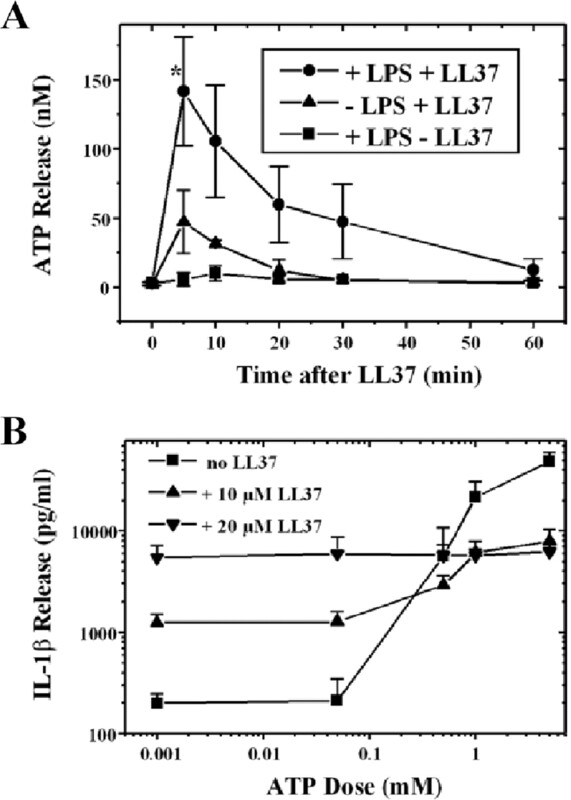 LL37 induces a transient release of ATP, membrane permeability, caspase-1 activation, and IL-1β release without cell cytotoxicity. IL-1β release and cell permeability are suppressed by pretreatment with the P2X7 inhibitors oxidized ATP, KN04, and KN62. In the presence of apyrase, which hydrolyzes ATP to AMP, the effect of LL37 was not altered, indicating that LL37 rather than autocrine ATP is responsible for the activation of the P2X7 receptor. We conclude that endogenous LL37 may promote IL-1β processing and release via direct activation of P2X7 receptors. Interleukin-1β is a proinflammatory cytokine that requires processing by the IL-1β converting enzyme (or caspase-1). Bacterial LPS is a potent inducer of IL-1β synthesis through activation of the Toll-like receptor 4. IL-1β is regulated posttranscriptionally, and a particularly important aspect of regulation occurs at the level of release (1). Efficient generation of active IL-1β appears to require two separate stimuli: 1) a priming stimulus to promote synthesis of the procytokine, e.g., LPS, and 2) a secretion stimulus to initiate posttranslational processing and release (2). After induction of synthesis, IL-1β accumulates in the cytosol in its proform. Also, IL-1β lacks a classic signal sequence that would target it to the membrane of the endoplasmic reticulum and to the release pathway via the Golgi apparatus (3, 4). It has been shown that extracellular ATP serves as a secretion stimulus in primed monocytes, leading to a rapid induction of the IL-1β release pathway by engagement of the purinergic receptor P2X7 (5). The P2X7 receptor, a member of the P2X family of nucleotide-gated channels, is a 595-aa polypeptide with two membrane-spanning domains and intracellular N- and C-terminal domains (6). In contrast to other members of the family, P2X7 is predominantly expressed by monocytic cells such as monocytes, macrophages, as well as dendritic cells (5, 7, 8). In addition, activation of P2X7 by ATP does not only lead to an ionic current, but also to alterations in cell morphology (9), to cell permeabilization, and to cytolysis after prolonged exposure to the agonists (10). In vitro studies with ATP show that concentrations in the 0.5–5 mM range are needed to fully activate P2X7-induced IL-1β release. This is similar to cytosolic concentrations of ATP, but is high for function in the extracellular compartment. Thus, many questions remain about how the P2X7 receptor-mediated IL-1β processing works in vivo. In this context, newly described antimicrobial peptides are known to have membrane-permeabilizing activity, and hence are potential mediators of cell membrane events promoting IL-1β release (10). Recently, Perregaux et al. (2) showed that protegrins are effective inducers of IL-1β posttranslational processing by a P2X7-independent pathway. Protegrins are antimicrobial peptides derived by proteolytic cleavage from a precursor of porcine cathelicidin. Cationic peptide 18 (hCAP18)3 represents the only human cathelicidin family member identified to date. hCAP18 is an 18-kDa molecule predominantly found in neutrophils, in cells of the bone marrow, and in epithelial cells (11, 12). Within neutrophils, the human cathelicidin is stored as an inactive proform within peroxidase-negative granules. The active biologic domains of cathelicidins generally reside in the C terminus. The C-terminal antimicrobial peptides are activated when cleaved from the precursor forms by serine proteases from azurophil granules (13). The bioactive C terminus of hCAP18, LL37, has been shown to exert antimicrobial activity toward both Gram-negative (minimal inhibitory concentration 12–25 μM) and Gram-positive bacteria (0.75–1.5 μM), to neutralize LPS (minimal active concentration 12.5 μg/ml, and to have chemotactic activity for neutrophils, monocytes, and T cells) (effective concentration 1–10 μM) (14). The chemotactic activity is mediated by engagement of LL37 with a member of the formyl peptide receptor family, formyl peptide receptor-like 1 (FPRL1). The search for a physiologically relevant secretion stimulus of IL-1β led us to investigate the effect of LL37 on the release of IL-1β by LPS-primed monocytes. We found that LL37 can act as an IL-1β secretion stimulus in monocytes by activation of the P2X7-mediated release pathway. LL37 was custom synthesized with 99% purity, as confirmed by mass spectroscopy by Genemed Synthesis (South San Francisco, CA). The hexapeptide WKYMVm was purchased from Phoenix Pharmaceuticals (Belmont, CA). Bacterial LPS, Escherichia coli strain 0127:B8, Westphal preparation, was from Difco (Detroit, MI). RPMI 1640 and PBS were purchased from BioWhittaker (Walkersville, MD), and FBS was from HyClone Laboratories (Logan, UT). All other reagents were obtained from Sigma-Aldrich (St. Louis, MO), unless otherwise specified. Fresh human blood was obtained from normal donors and diluted 1/1 with sterile saline solution. The solution was subsequently centrifuged through a Histopaque-1077 gradient column at 600 × g for 20 min at 4°C. The mononuclear layer was removed, washed, and spun twice in RPMI 1640, and the cells were counted. After this purification, the resulting population of PBMC was positively selected using anti-CD14-coated magnetic beads (Miltenyi Biotec, Auburn, CA), following the instructions of the manufacturer. This procedure consistently leads to a >98% pure population of CD14-positive cells, confirmed by flow cytometry analysis. Purified monocytes were cultured at 106 cells/ml in RPMI 1640 with 10% FBS for all experiments, unless noted otherwise. Sandwich ELISAs were developed in our laboratory to detect mature IL-1β, as described (15). Briefly, anti-human mouse IL-1β mAb (clone 8516; R&D Systems, Minneapolis, MN) was used as a coating Ab, and a rabbit polyclonal mature IL-1β Ab (raised against entire 17-kDa mature IL-1β) as sandwich Ab. HRP-conjugated goat anti-rabbit Ab (Bio-Rad, Hercules, CA) was used as a developing Ab and colorimetrically quantified after addition of 3,3′,5,5′-tetramethylbenzidine (Moss, Pasadena, MD) as substrate. Samples were read by a Dynatech MRX plate reader at 450 nm and compared with human rIL-1β (R&D Systems) using Revelation software (Dynatech Laboratories, Chantilly, VA). IL-8 release was measured by a sandwich ELISA, as previously described (16). Briefly, a mouse anti-human IL-8 mAb (R&D Systems) was used as the capture Ab, and a rabbit anti-human IL-8 polyclonal Ab (Endogen, Boston, MA) was used to complex the Ag. This complex was detected colorimetrically, as described for IL-1β. rIL-8 as a standard was purchased from R&D Systems. LDH release into cell culture supernatant was quantified using an LDH assay kit (Sigma-Aldrich), following the instructions of the manufacturer, and using cell culture medium free of phenol red. Fresh monocytes were lysed with the lysing solution provided in the kit to harvest the total intracellular LDH. The cell lysate was then diluted with medium to obtain an 8-point standard curve (100, 50, 37.5, 25, 12.5, 6.25, and 3.13%, with medium serving as a blank). The emitted light was detected with a luminometer (Berthold Systems, Aliquippa, PA). Caspase-1 activity was determined using the fluorogenic substrate Ac-WEHD-AMC (Alexis Biochemicals, San Diego, CA). After lysing the cells with lysing buffer (50 mM HEPES, pH 7.4, 0.1% 3-[(3-cholamidopropyl)dimethylammonio]-1-propanesulfonate, 100 mM NaCl, 0.1 mM EDTA, 1 mM CLAP, 1 mM DTT) for 20 min on ice, the cells were spun down and 50 μl of the cell extract was mixed with 50 μl of assay buffer (50 mM HEPES, pH 7.4, 0.1% 3-[(3-cholamidopropyl)dimethylammonio]-1-propanesulfonate, 100 mM NaCl, 0.1 mM EDTA, 20% glycerol, 10 mM DTT) and 5 μl of substrate (48 μM final) in a black Costar (Cambridge, MA) 96-well cluster plate. The plate was read on a Cytoflour II, Fluorescence MultiWell Plate Reader (PerSeptive Biosystems, Framingham, MA), at 360 nm excitation, 460 nm emission, for 2 h. The caspase-1 activity was normalized for protein concentration (Bradford assay; Bio-Rad). YO-PRO-1 (Molecular Probes) is a fluorescent nucleic acid dye, which exhibits significant fluorescence enhancements upon binding to RNA and DNA. In contrast to other members of the cyanine monomer family, which are characteristically live-cell impermeant, it has been shown that YO-PRO-1 passes through P2X7 receptor channels of live cells (17, 18, 19). 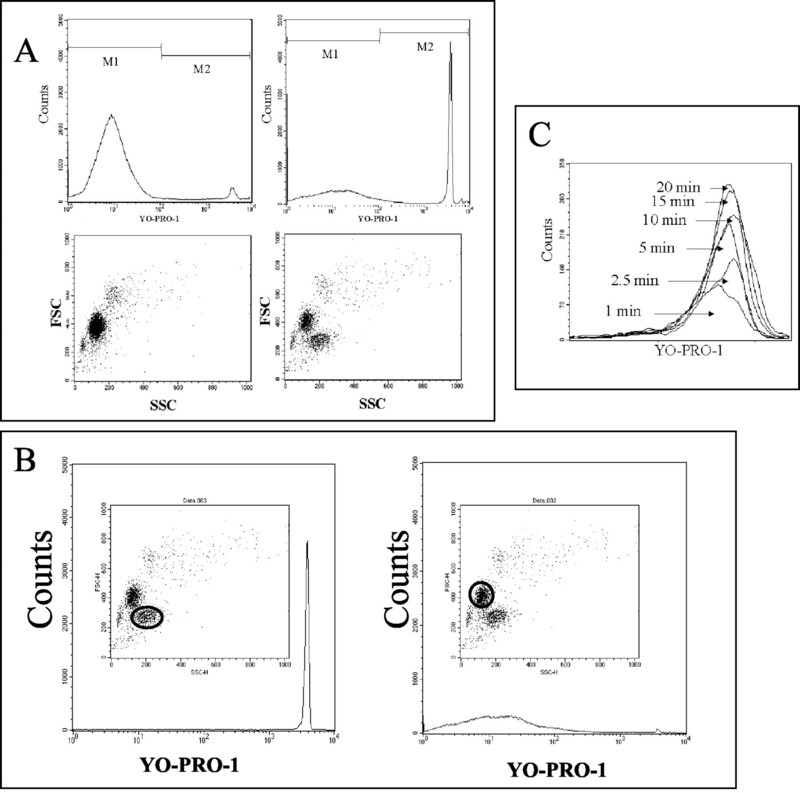 Flow cytometry was used to detect the uptake of YO-PRO-1 by detection of the shift in fluorescence intensity. Fresh monocytes were suspended at 106 cells/ml, as described above, treated with 1 ng/ml LPS, and put in the incubator for 3 h. At 3 h, HEPES buffer (pH 7.4, 10 mM final concentration) and YO-PRO-1 (5 μM final concentration) were added. After vortexing, the tube was read on a FACSCalibur (BD Biosciences, San Jose, CA), and LL37 was added to the samples, as indicated. Calibration was done daily using CaliBrite fluorescent standards to insure optimal instrument performance. Fluorescence and forward and side scatter data were acquired by using a 488-nm air-cooled argon laser as an excitation source, and fluorescent emission data were collected by using a 530-nm band pass filter. Events of interest were isolated by virtue of their forward and side scatter characteristics. Temperature was maintained at 37°C, and a continuous gated event flow rate was recorded during a 20-min period of data acquisition. All data were expressed as mean ± SEM. Statistics were performed using Microsoft Excel (Microsoft, Redmond, WA) in combination with Winstat statistical software (R. Fitch Software, Staufen, Germany). Comparisons of groups for statistical difference were done using the Student’s t test or the ANOVA for multiple comparisons. Statistical significance was defined as a p value <0.05. Initial experiments showed that LL37 treatment of freshly isolated CD14-positive monocytes not only did not induce IL-1β release, but also blocked LPS-induced release of IL-1β, confirming earlier reports that LL37 can neutralize the activity of LPS (11, 20), LL37 (10 μM) (Table I⇓). However, because LL37 may have membrane-perturbing effects, we next investigated the effect of LL37 on monocytes that had been primed with LPS. Fresh CD14-positive monocytes were cultured in medium alone or treated with 1 ng/ml LPS for 3 h before addition of 10 or 20 μM LL37. No release of IL-1β into the cell culture supernatant was detected in untreated monocytes. Addition of LL37 led to an earlier and increased release of IL-1β in a dose-dependent fashion, when compared with LPS-treated monocytes without addition of LL37 (Fig. 1⇓A). Addition of LL37 to LPS-primed monocytes had no influence on the release of IL-8 compared with unstimulated LPS-primed monocytes (Fig. 1⇓B). Because IL-8 is a sensitive activation marker for monocytes, the lack of the induction of release by LL37 suggests that LL37 specifically activates the secretion pathway of IL-1β. Effect of LL37 after LPS priming. A, Effect of LL37 on IL-1β release by LPS-primed monocytes. Monocytes were primed for 3 h with 1 ng/ml LPS (except ▪ = control, untreated monocytes). Additionally, cells were stimulated with 10 μM (▴) or 20 μM (▾) LL37 after 3 h of priming (t = 0). Stimulation with LL37 resulted in a dose-dependent and significantly increased release of IL-1β. ∗, Statistically significant difference compared with LPS-primed monocytes without addition of LL37 (•), t test. 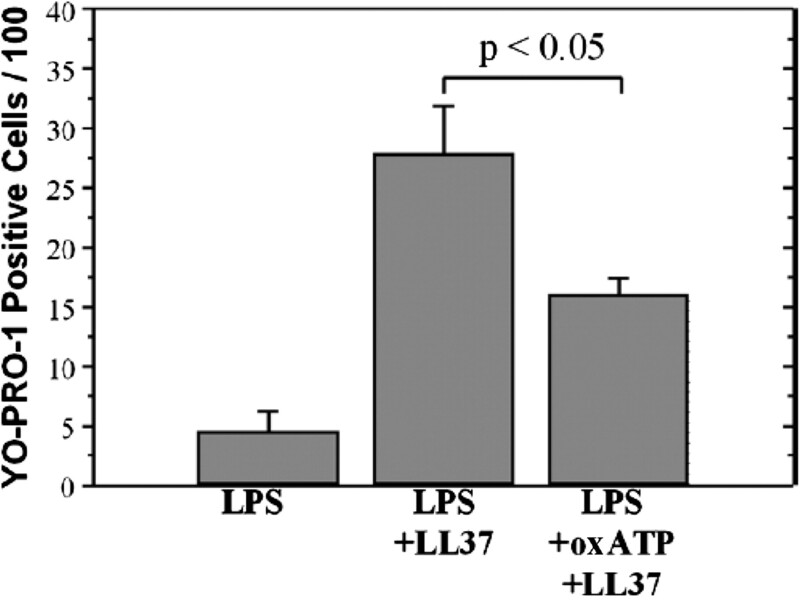 B, Effect of LL37 on IL-8 release by LPS-primed monocytes. Monocytes were primed for 3 h with 1 ng/ml LPS (except ▪ = control, untreated monocytes). Additionally, cells were stimulated with 10 μM (▴) or 20 μM (▾) LL37 after 3 h of priming (t = 0). Stimulation with LL37 did not result in a different release of IL-8 compared with LPS-primed monocytes without addition of LL37 (•). C, Ability of LL37 to induce caspase-1 activation. Stimulation of LPS (1 ng/ml)-primed monocytes with LL37 (10 μM) or ATP (5 mM) resulted in a statistically significant increase of caspase-1 activity compared with untreated monocytes. No difference was seen between the caspase-1 activity of LPS-treated monocytes without addition of a second stimulus compared with untreated monocytes. To assess whether the IL-1 release was due to cell toxicity, we quantified LDH in the cell supernatant as a marker of cell permeabilization. Only LPS-primed monocytes treated with 5 mM ATP significantly released LDH into the supernatant (Table II⇓). Importantly, the treatment of monocytes with LL37 (10 or 20 μM) did not significantly increase LDH release, regardless of LPS priming. Furthermore, the kinetics of the low level LDH release that was detected did not match the release kinetics of IL-1β, making it unlikely that unspecific cell damage and permeabilization explain the LL37-induced release of IL-1β from monocytes. Caspase-1 is critical for processing IL-1β, and has been linked to the release pathway of this cytokine. It has been shown that caspase-1−/− macrophages are impaired for IL-1β release (21). In addition, it has been shown by our group and others (8, 15, 22) that inhibition of caspase-1 prevented mature IL-1β release from LPS-primed and ATP-stimulated monocytes. We compared the caspase-1 activity of LPS-primed and LL37-stimulated monocytes with LPS-primed and ATP-stimulated monocytes, monocytes treated with LPS or LL37 alone, as well as untreated monocytes. When indicated, LPS (1 ng/ml) was added at t = −3 h, and LL37 (10 μM), or ATP (5 mM) at t = 0 h. The caspase-1 activity was quantified at t = 1 h (after 4 h in culture). We found a significant increase of caspase-1 activity in LPS-primed monocytes after stimulation with LL37 compared with untreated monocytes. An increase of caspase-1 activation was also observed in LPS-primed monocytes stimulated with ATP (Fig. 1⇑C). It is noteworthy that the LL37 activation of caspase-1 required a priming step, as has been reported for ATP (8). It has been shown that LL37 uses FPRL1 as a receptor to chemoattract human peripheral blood neutrophils, monocytes, and T cells (23). To characterize whether the observed effect of LL37 on IL-1β release is mediated by FPRL1, we examined the effect of pertussis toxin (PTX), a reagent known to selectively block Gi protein-coupled signaling like FPRL1 (14), on LL37-induced IL-1β release of LPS-primed monocytes. In contrast to the chemotactic effect of LL37, treatment of monocytes with PTX (50, 100, and 200 ng/ml) at 37°C for 30 min (t = 0, LPS; t = 2.5 h, PTX; t = 3 h, LL37; t = 4 h, quantification of IL-1 release) and 6 h (t = 0, PTX; t = 3 h, LPS; t = 6 h, LL37; t = 7 h, quantification of IL-1 release) before stimulation with LL37 did not inhibit subsequent IL-1β release, indicating that the Gi protein-coupled receptor FPRL1 is not involved in LL37-induced IL-1β release of LPS-primed monocytes (Fig. 2⇓A). Function of FPRL1 receptor on IL-1β release. FPRL1 receptor inhibition. Treatment with PTX (50, 100, and 200 ng/ml), a reagent known to block signaling through FPRL1, did not inhibit LL37-induced IL-1β release of LPS-primed monocytes when given 30 min or 6 h before addition of LL37 (A). WKYMVm, a potent activator of FPRL1, had no effect on IL-1β release of LPS-primed monocytes (B). To further investigate the possible involvement of FPRL1, we studied the release of IL-1β by LPS-primed monocytes in response to the hexapeptide WKYMVm, a potent activator of formyl peptide receptors with preference for FPRL1. 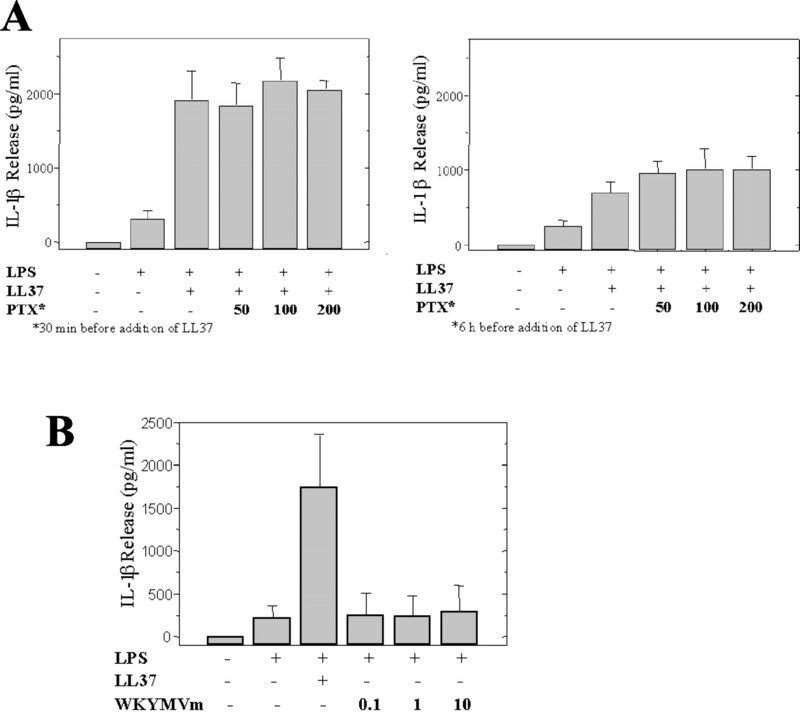 No effect on IL-1β release was observed using concentrations of WKYMVm that are effective to induce chemotaxis and calcium mobilization (24) or desensitize chemokine receptors (25) by engagement with FPRL1 (Fig. 2⇑B). Because ATP is a secretory stimulus of IL-1β release and activator of caspase-1, we asked whether it is involved in the observed effect of LL37. Using the sensitive firefly luciferase detection assay described above, we found release of ATP, peaking 5–10 min after addition of LL37 and returning to baseline level within 1 h (Fig. 3⇓A). Significant release of ATP was dependent upon priming with LPS. Although not statistically significant, a less pronounced release of ATP was seen in LL37-treated monocytes without LPS priming. Role of ATP in LL37 effect. A, Release of ATP by LL37. ATP release was detected by firefly luciferase assay. Monocytes (106/ml) were cultured without LPS or primed with LPS (1 ng/ml) in RPMI 1640 for 3 h and then monitored for ATP release in the presence or absence of LL37 (10 μM). LPS priming, followed by LL37, induced a significant release of ATP compared with LPS alone, p < 0.05. B, LL37 interference with exogenous ATP addition. Monocytes were cultured with LPS (1 ng/ml) for 3 h, then treated with nothing or LL37 (either 10 or 20 μM) just before addition of increasing concentrations of ATP. Supernatants were assayed for IL-1β release at 1 h.
In this experiment, we tested whether the addition of LL37 interfered with the dose-response relationship of ATP on the release of IL-1β of LPS-primed monocytes. Monocytes were primed for 3 h with LPS (1 ng/ml) and then stimulated with different concentrations of ATP. Alternatively, LL37 (10 or 20 μM) was added shortly before addition of ATP. Interestingly, the addition of LL37 interfered with the effect of ATP. After addition of LL37, ATP could not increase the release of IL-1β above the level of the IL-1β release provoked by LL37 alone (Fig. 3⇑B). To induce secretion of IL-1β, ATP has to bind to the purinergic receptor P2X7 on monocytes. The ATP activity can be inhibited by blocking its binding site on P2X7 by either oxidized ATP or the isoquinolene derivates KN-04 and KN-62 (26, 27). Using these inhibitors, we found a significant, dose-dependent inhibition of IL-1β release, not only for LPS-primed monocytes stimulated with ATP, but also for those stimulated with LL37 (Fig. 4⇓). We therefore conclude that the effect of LL37 on IL-1β release involves engagement of the P2X7 receptor at the binding site for ATP. Inhibition of P2X7 receptor inhibits LL37 effect. Monocytes were cultured with or without LPS (1 ng/ml) for 3 h, and then in some cases also with LL37 (10 μM) (left panels) or ATP (5 mM) for 1 h (right panels). 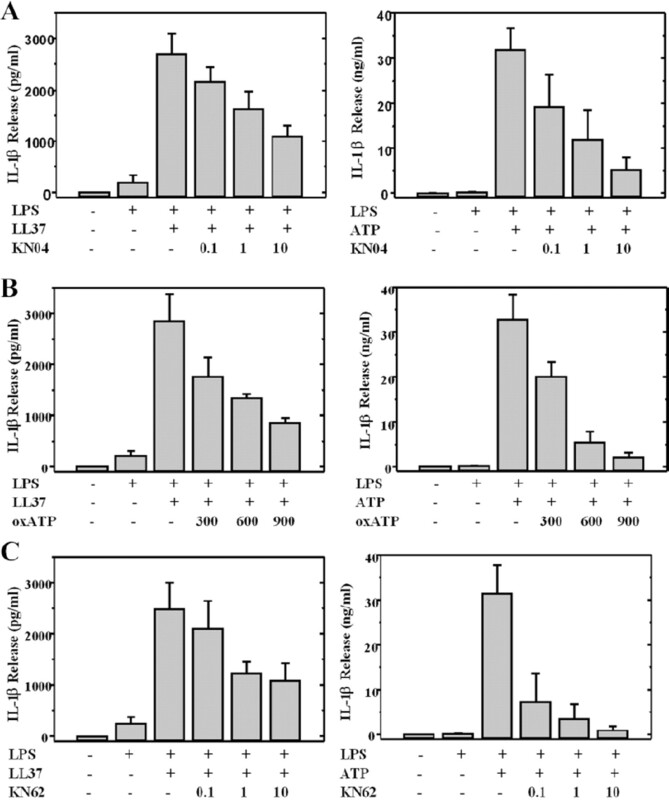 The P2X7 receptor inhibitors, KN-04 (A), oxATP (B), or KN-62 (C), were compared for their ability to inhibit IL-1β into the supernatant as measured by ELISA. To test whether autocrine ATP release is responsible for the activation of P2X7 and the release of IL-1β, we repeated our experiments in the presence of apyrase, an enzyme known to inhibit autocrine ATP by hydrolyzing any released ATP to AMP (4). When added at a concentration of 20 U/ml, apyrase did not significantly alter the effect of LL37 on IL-1β release (Fig. 5⇓). In contrast, apyrase efficiently inhibited release of IL-1β induced by exogenous ATP. Effect of apyrase. A, Monocytes were primed with LPS (1 ng/ml) and stimulated with LL37 (10 μM) in the presence or absence of apyrase (20 U/ml). B, Alternatively, LPS-primed monocytes were stimulated with ATP (5 mM) in the presence or absence of apyrase (20 U/ml). Stimulation of the P2X7 receptor with ATP leads to cell membrane pore formation, followed by a potassium efflux, which then triggers the maturation and secretion of IL-1β (28, 29). The yellow dye YO-PRO-1 has been successfully used to demonstrate ATP-induced cell pore formation that allows permeabilization for molecules up to a molecular mass of 900 Da (30). With its molecular mass of 629 Da, YO-PRO-1 is able to enter the cell through the pores, which can be detected by the >100-fold increase in fluorescence intensity that is induced by its intercalation with nucleic acids, RNA or DNA. Using flow cytometry to detect the fluorescence dye uptake by living cells, we observed a marked increase in uptake of YO-PRO-1 in LPS-primed monocytes stimulated with LL37, compared with cells treated with LPS alone (Fig. 6⇓A). We also noticed that YO-PRO-1 was predominantly detected in a new population of cells characterized by less forward and higher side scatter (Fig. 6⇓B) that began to develop within minutes after stimulation with LL37 (Fig. 6⇓C). To address the question whether the cell permeabilization visualized by YO-PRO-1 uptake can be attributed to the binding of ATP to P2X7, we added the irreversible P2X7 inhibitor oxidized ATP (oxATP) before stimulation with LL37. Addition of oxATP resulted in a significant decrease of YO-PRO-1 uptake, confirming that the observed cell permeabilization can be largely explained by the action of ATP (Fig. 7⇓). LL37 induction of pore formation in monocytes. A, Effect of LL37 on uptake of YO-PRO-1 by LPS-primed monocytes. Monocytes were primed with LPS (1 ng/ml) for 3 h, followed by LL37 (10 μM) for 1 h before addition of YO-PRO-1, and then flow cytometric analysis. The upper left histogram (monocytes treated with LPS alone) shows 95.7% of the cells in the low fluorescent intensity spectrum (M1). In the upper right histogram (monocytes primed with LPS and stimulated with LL37), a shift of the fluorescence intensity spectrum of YO-PRO-1 of ∼2 orders of magnitude could be observed, showing 41.9% of the cells in the high fluorescence intensity spectrum (M2). The lower panels show the forward scatter (FSC) and side scatter (SSC) characteristics of these monocyte preparations. B, Analysis of the population responsible for the YO-PRO-1 uptake. Monocytes stimulated with both LPS and LL37 as in A (right panels) were further gated to characterize the YO-PRO-1 positivity population. Left panel shows gating on the low FSC, high SSC population, and right panel shows gating on the high FSC and high SSC population. C, Kinetics of YO-PRO-1 uptake. To characterize the speed of YO-PRO-1 staining, monocytes primed with LPS (1 ng/ml) were studied at indicated time points after LL37 stimulation for intensity of YO-PRO-1 signal. Oxidized ATP inhibition of pore formation induced by LL37. Monocytes (n = 3 donors) were cultured at 106/ml in RPMI 1640/10% FBS in the presence of LPS (1 ng/ml) for 3 h. Then LL37 (20 μM) was added, and the cells were immediately transferred to the flow cytometer. Alternatively, oxATP (100 μM) was added 30 min before addition of LL37 to block P2X7 receptors. Cells were analyzed for YO-PRO-1 uptake by flow cytometry. Addition of oxATP resulted in a significant decrease of YO-PRO-1 uptake. Although ATP is widely accepted as a stimulus for the activation of caspase-1 and release of IL-1β, the source and regulation of extracellular ATP necessary for activation of the P2X7 receptor remained unclear. In this study, we describe that the human cathelicidin-derived peptide LL37 stimulates IL-1β secretion from monocytes by activation of the P2X7 receptor. This effect was not explained by autocrine ATP release. Moreover, in contrast to previous studies using exogenous ATP as a stimulus, we did not observe an increase of cytolysis in the LL37-stimulated cells compared with untreated monocytes or monocytes treated with LPS alone. Although LL37 treatment did not lead to increased LDH release, it induced a transient release of ATP. Confirming previous observations (6), we found that doses of exogenous ATP in the 0.5–5 mM range are necessary to activate P2X7 efficiently. Thus, the concentration of released ATP after addition of LL37 was ∼4000 times less than the dose of exogenously added ATP needed to produce the same IL-1β release. Sustained activation of P2X7 receptors with ATP can lead to cell death through extended cell permeabilization, which leads to electrolyte misbalance, resulting in sodium and calcium overload as well as potassium depletion (31, 32). However, shorter permeabilization periods are better tolerated (26), and the cells may be able to reseal their membrane and to rebalance their electrolyte levels (33). We observed a significant change in the cell morphology starting immediately after addition of LL37 to LPS-primed monocytes. The developing cell population was characterized by a decrease in size and an increase in granularity, shown by the flow cytometrical change of forward and side light scatter. It might be argued that the ATP levels detected in the medium probably underestimate the actual concentration at the cell membrane, and liberated ATP might be scavenged by the P2X7 receptor immediately upon release. To verify that autocrine ATP was not responsible for the LL37-induced IL-1β release, we added a large amount of apyrase, an enzyme known to inhibit P2X7 receptor activation by the immediate hydrolyzation of ATP to AMP. We showed that apyrase was able to block IL-1β release by exogenous ATP, but not by LL37, suggesting that LL37 is a direct agonistic modulator of the P2X7 receptor. Because the specific P2X7 receptors used in our study did not completely block the release of IL-1β, there might be a second nonspecific effect of LL37 on IL-1β release. It is known that LL37 is able to permeabilize and disintegrate bacterial walls (12–25 μM for E. coli) (23), and it has been shown to be toxic to peripheral blood leukocytes in concentrations starting at 25 μM in the presence of 5% FBS (34). It seems to be likely that the concentrations of LL37 (10–20 μM in the presence of 10% FBS) used in this study lead to a minor, transient damage of the cell membrane. In contrast to bacteria, mammalian cells such as monocytes may, to a certain extent, be able to repair the transiently disrupted membranes, thereby preventing leakage of macromolecules such as LDH and limiting the release of cytosolic components to small molecules such as ATP (molecular mass: 507 Da). Following this reasoning, the permeabilization by LL37 may also lead to a short potassium efflux that could induce activation of caspase-1 and IL-1β release independent from the activation of P2X7 by ATP or LL37. This theory would explain why the P2X7 inhibitors used in this study were less effective in preventing IL-1β release after the stimulation with LL37 compared with exogenous ATP. It could also explain why the addition of periodate-oxidized ATP, an irreversible P2X7 inhibitor, could neutralize only about half of the uptake of the exclusion dye YO-PRO-1, which was monitored during the first 20 min after stimulation with LL37. Cathelicidins are important antimicrobial effector proteins of the innate immune system capable of protecting body surfaces from invasive bacterial infection (35). Perregaux et al. (2) were the first to show that protegrins, members of the cathelicidin family, induce release of IL-1β. However, the porcine protegrins exert their activity independently from the P2X7 stimulation pathway. Our findings indicate that the human cathelicidin-derived peptide LL37 links the innate immune response to the adaptive immune system by regulating the release of IL-1β, a key cytokine in immunity. It is known that LL37 can be locally induced by 10- to 50-fold at sites of inflammation within epithelial cells of skin and lung (10, 32, 33), and invading neutrophils may represent an additional source for the peptide (34). In a xenograft model of normal human airway epithelia, the concentration of LL37 in the epithelial lining fluid was found to be 2 μg/ml (or ∼0.4 μM) (35). Therefore, the concentrations of LL37 used in our study are characteristic for a local mucosal environment, e.g., the lung during inflammation. The requirement of ATP for IL-1β release in vivo has been questioned in the past because the concentration of extracellular ATP needed for the stimulation of IL-1β secretion seemed to be nonphysiological. LL37 stimulation may provide a physiological way to liberate cellular ATP and to induce IL-1β maturation and release. ↵3 Abbreviations used in this paper: hCAP18, cationic peptide 18; FPRL1, formyl peptide receptor-like 1; LDH, lactate dehydrogenase; PTX, pertussis toxin; oxATP, oxidized ATP. Perregaux, D. G., K. Bhavsar, L. Contillo, J. Shi, C. A. Gabel. 2002. Antimicrobial peptides initiate IL-1β: posttranslational processing: a novel role beyond innate immunity. J. Immunol. 168:3024. Walter, P., A. E. Johnson. 1994. Signal sequence recognition and protein targeting to the endoplasmic reticulum membrane. Annu. Rev. Cell Biol. 10:87. Singer, I. I., S. Scott, G. L. Hall, G. Limjuco, J. Chin, J. A. Schmidt. 1988. Interleukin 1β is localized in the cytoplasmic ground substance but is largely absent from the Golgi apparatus and plasma membranes of stimulated human monocytes. J. Exp. Med. 167:389. Mutini, C., S. Falzoni, D. Ferrari, P. Chiozzi, A. Morelli, O. R. Baricordi, G. Collo, P. Ricciardi-Castagnoli, F. Di Virgilio. 1999. Mouse dendritic cells express the P2X7 purinergic receptor: characterization and possible participation in antigen presentation. J. Immunol. 163:1958. North, R. A., A. Surprenant. 2000. Pharmacology of cloned P2X receptors. Annu. Rev. Pharmacol. Toxicol. 40:563. Collo, G., S. Neidhart, E. Kawashima, M. Kosco-Vilbois, R. A. North, G. Buell. 1997. Tissue distribution of the P2X7 receptor. Neuropharmacology 36:1277. Mehta, V. B., J. Hart, M. D. Wewers. 2001. ATP-stimulated release of interleukin (IL)-1β and IL-18 requires priming by lipopolysaccharide and is independent of caspase-1 cleavage. J. Biol. Chem. 276:3820. Cohn, Z. A., E. Parks. 1967. The regulation of pinocytosis in mouse macrophages. II. Factors inducing vesicle formation. J. Exp. Med. 125:213. MacKenzie, A. B., A. Surprenant, R. A. North. 1999. Functional and molecular diversity of purinergic ion channel receptors. Ann. NY Acad. Sci. 868:716. Larrick, J. W., M. Hirata, R. F. Balint, J. Lee, J. Zhong, S. C. Wright. 1995. Human CAP18: a novel antimicrobial lipopolysaccharide-binding protein. Infect. Immun. 63:1291. Bals, R., X. Wang, M. Zasloff, J. M. Wilson. 1998. The peptide antibiotic LL-37/hCAP-18 is expressed in epithelia of the human lung where it has broad antimicrobial activity at the airway surface. Proc. Natl. Acad. Sci. USA 95:9541. Oren, Z., J. C. Lerman, G. H. Gudmundsson, B. Agerberth, Y. Shai. 1999. Structure and organization of the human antimicrobial peptide LL-37 in phospholipid membranes: relevance to the molecular basis for its non-cell-selective activity. Biochem. J. 341:501. Zasloff, M.. 2002. Antimicrobial peptides of multicellular organisms. Nature 415:389. Wewers, M. D., H. A. Dare, A. V. Winnard, J. M. Parker, D. K. Miller. 1997. IL-1β-converting enzyme (ICE) is present and functional in human alveolar macrophages: macrophage IL-1β release limitation is ICE independent. J. Immunol. 159:5964. Marsh, C. B., J. E. Gadek, G. C. Kindt, S. A. Moore, M. D. Wewers. 1995. Monocyte Fcγ receptor cross-linking induces IL-8 production. J. Immunol. 155:3161. Solle, M., J. Labasi, D. G. Perregaux, E. Stam, N. Petrushova, B. H. Koller, R. J. Griffiths, C. A. Gabel. 2000. Altered cytokine production in mice lacking P2X7 receptors. J. Biol. Chem. 276:125. Michel, A. D., R. Kaur, I. P. Chessell, P. P. Humphrey. 2000. Antagonist effects on human P2X7 receptor-mediated cellular accumulation of YO-PRO-1. Br. J. Pharmacol. 130:513. Michel, A. D., I. P. Chessell, A. D. Hibell, J. Simon, P. P. Humphrey. 1998. Identification and characterization of an endogenous P2X7 (P2Z) receptor in CHO-K1 cells. Br. J. Pharmacol. 125:1194. Nagaoka, I., S. Hirota, F. Niyonsaba, M. Hirata, Y. Adachi, H. Tamura, D. Heumann. 2001. Cathelicidin family of antibacterial peptides CAP18 and CAP11 inhibit the expression of TNF-α by blocking the binding of LPS to CD14+ cells. J. Immunol. 167:3329. Li, P., H. Allen, S. Banerjee, S. Franklin, L. Herzog, C. Johnston, J. McDowell, M. Paskind, L. Rodman, J. Salfeld, et al 1995. Mice deficient in IL-1β-converting enzyme are defective in production of mature IL-1β and resistant to endotoxic shock. Cell 80:401. Sanz, J. M., F. Di Virgilio. 2000. Kinetics and mechanism of ATP-dependent IL-1β release from microglial cells. J. Immunol. 164:4893. Yang, D., Q. Chen, A. P. Schmidt, G. M. Anderson, J. M. Wang, J. Wooters, J. J. Oppenheim, O. Chertov. 2000. LL-37, the neutrophil granule- and epithelial cell-derived cathelicidin, utilizes formyl peptide receptor-like 1 (FPRL1) as a receptor to chemoattract human peripheral blood neutrophils, monocytes, and T cells. J. Exp. Med. 192:1069. Le, Y., W. Gong, B. Li, N. M. Dunlop, W. Shen, S. B. Su, R. D. Ye, J. M. Wang. 1999. Utilization of two seven-transmembrane, G protein-coupled receptors, formyl peptide receptor-like 1 and formyl peptide receptor, by the synthetic hexapeptide WKYMVm for human phagocyte activation. J. Immunol. 163:6777. Li, B. Q., M. A. Wetzel, J. A. Mikovits, E. E. Henderson, T. J. Rogers, W. Gong, Y. Le, F. W. Ruscetti, J. M. Wang. 2001. The synthetic peptide WKYMVm attenuates the function of the chemokine receptors CCR5 and CXCR4 through activation of formyl peptide receptor-like 1. Blood 97:2941. Murgia, M., S. Hanau, P. Pizzo, M. Rippa, F. Di Virgilio. 1993. Oxidized ATP: an irreversible inhibitor of the macrophage purinergic P2Z receptor. J. Biol. Chem. 268:8199. Walev, I., K. Reske, M. Palmer, A. Valeva, S. Bhakdi. 1995. Potassium-inhibited processing of IL-1β in human monocytes. EMBO J. 14:1607. Steinberg, T. H., A. S. Newman, J. A. Swanson, S. C. Silverstein. 1987. ATP4− permeabilizes the plasma membrane of mouse macrophages to fluorescent dyes. J. Biol. Chem. 262:8884. Blanchard, D. K., S. Wei, C. Duan, F. Pericle, J. I. Diaz, J. Y. Djeu. 1995. Role of extracellular adenosine triphosphate in the cytotoxic T-lymphocyte-mediated lysis of antigen presenting cells. Blood 85:3173. Steinberg, T. H., S. C. Silverstein. 1987. Extracellular ATP4− promotes cation fluxes in the J774 mouse macrophage cell line. J. Biol. Chem. 262:3118. Murgia, M., P. Pizzo, T. H. Steinberg, F. Di Virgilio. 1992. Characterization of the cytotoxic effect of extracellular ATP in J774 mouse macrophages. Biochem. J. 288:897. Johansson, J., G. H. Gudmundsson, M. E. Rottenberg, K. D. Berndt, B. Agerberth. 1998. Conformation-dependent antibacterial activity of the naturally occurring human peptide LL-37. J. Biol. Chem. 273:3718. Nizet, V., T. Ohtake, X. Lauth, J. Trowbridge, J. Rudisill, R. A. Dorschner, V. Pestonjamasp, J. Piraino, K. Huttner, R. L. Gallo. 2001. Innate antimicrobial peptide protects the skin from invasive bacterial infection. Nature 414:454.